Wigwam Holidays are the latest Camping trend and are proving very popular with good reason. These wooden tents in the Lake District, allow all the freedom of camping whilst providing more shelter during Cumbria's often unpredictable weather. Very similar to Camping Pods, they are practical for adults and great fun for kids - a kind of Camping Den! Fabulous deluxe Wigwams with en-suite shower & toilet ideal for exploring the western reaches of Hardrians Wall and the National Cycle Network route 72 in addition, of course, to being situated in Cumbria's Solway Coast Area of Outstanding Natural Beauty, renowned for it's birdlife and stunning coastal landscapes. The Wallsend site has a tea room which is open from April to October and is just 25 minutes from the Scottish border and 45 minutes from the northern Lakes. The village pub Kings Arms serves Solway salmon caught using traditional haaf nets as well as other locally sourced meals. The Wigwams are sturdy wooden cabins that can sleep up 3, 4 or 5 depending on which Wigwam style you choose and how friendly you are/ how well you know the rest of your camping group! Foam mattresses are provided, but you will need to take your own sleeping bag and other items you would generally need for camping minus, of course, the tent. The Wigwam has a fridge, cutlery tray, broom, heater, lights, dustpan/brush, bin, washing up bowl, chopping board and a kettle for your use. If you prefer to go 'light' then why not hire a crockery set too? A grocery pack can also be pre-ordered. Cooking and washing can not be done in the Wigwam, however there is an outside area suitable for a BBQ or gas stove and ample washing facilities available on site. A fire basket is also provided, free usage, if logs are purchased from the shop. Please note that fires must be out by 23.00hours and a quite site policy is observed around the same time. 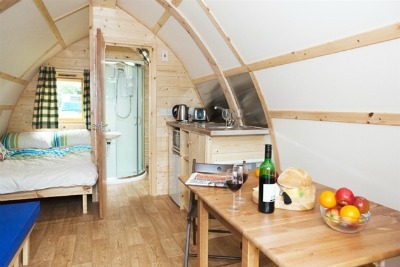 Two of the Wigwams have an en-suite loo and one an en-suite shower. For full information on what is included in these fabulous wooden tents and for all the facilities available please read more on the Woodclose Park website. Glamping in Cumbria. If you love the freedom of camping but don't like the hassle then you'll love these warm wooden tents, in the Eden Valley, which are available year round at Wild Rose Park in Appleby-in-Westmorland, Cumbria. 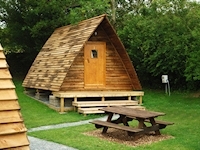 The Wigwams are made from sustainable home grown timber and are approx 16' by 12'. They have sky lights, insulation and a lockable door. They sleep a maximum of 5 people and are well situated by the Donkeys, an area which is normally closed after peak season, giving extra tranquility to Wigwam guests. These fun units come well equipped with electric light, heating, electric points, foam mattresses, fridge, kettle, toaster even a microwave and TV! All you need to bring is your sleeping bag and perhaps some microwave crockery and towels too. Outdoors picnic table and BBQ area. You will need to bring the following items bedding either sheets/duvet/pillows OR sleeping bags etc; cooking equipment; eating equipment; toiletries etc. Note: A crock box can be arranged at a nominal charge. More information on this lovely site at the edge of Ullswater and for current availability and tariff here. 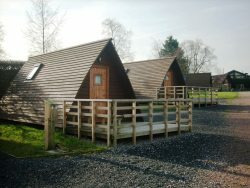 Just a few hundred yards from both the Hadrian's Wall Path and Sustrans Cycle Route 72, these Camping Cabins also known as Wigwams and Camping Pods are non-smoking and a great way for family and friend to have a no-fuss holiday that feels like camping but without any of the hassle of the tent! 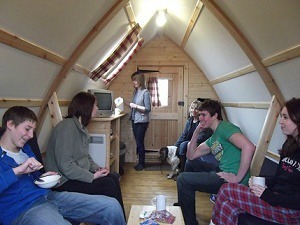 The Wigwams sleep between 4 and 6 depending on how friendly you are with the rest of your group! The beds are easily converted from the seating areas and pillows, sleeping bags and liners can be provided if requested. The cabins are insulated to a very high standard which means that it stays cool in the summer and warm during the winter. The cabin also have a convector heater which can be ideal for even the coldest of winters. The kitchen area is well equipped with a microwave oven/grill, fridge, toaster and kettle. There is also crockery, cutlery, pots and pans as well as all the essentials such as corkscrew/tin opener etc. A washing-up bowl and drying towel are also provided. There is no water inside these cabins but there is a water point very nearby. These cabins also have TV and radio. Full information, including tariff and availability can be found here.